Harry Toole (born Henry William Cleveland Toole at Oakleigh in 1897) was a capable follower-defender who was a member of Carlton’s 1921 Grand Final team in just his seventh senior AFL match. Originally recruited by the Blues from local amateur side Carlton Juniors, he finished off his 59-game career at Princes Park as vice-captain in his last 12 games. Toole wore guernsey number 22 in all but one of his senior appearances at Carlton, the exception being the first Semi Final in 1922 - when he wore number 6. He was a reliable and determined competitor with a good spring, who, despite his lack of height, was sometimes required to lead the Blues following division. Three of Harry’s first seven games were finals, culminating in a desperately hard-fought 4-point loss to Richmond in the 1921 Premiership decider. Toole was stationed in a back-pocket as second ruckman on that cold Melbourne afternoon, in a match played in constant rain and a swirling wind. Both sides hurled themselves into the fray and the result was in doubt right up until the final seconds. After playing finals football in 1921 and ‘22, the Blues drifted into decline. Harry stayed for three more seasons, but by 1925 had had enough. He called it quits just a few days after his 28th birthday, when the Blues fell to Fitzroy by two points at Brunswick St in the last match of another disappointing season. In May 1926, he was cleared to Albury, where he finished his playing career. Seventeen years after his last VFL match, Harry joined the many hundreds of then current and former players from all clubs who volunteered for military service in World War II. He fibbed a little about his age to make sure he was accepted, and eventually made it into uniform in 1942. After soldiering through to the end of the war, he made it home safely – but sadly, passed away at just 60 years of age, on the 13th of August, 1958. "At a meeting of the committee of the Albury Football Club, J. Toole ex vice captain of Carlton, was appointed as playing coach for the coming season." Same person? H. Toole was Carlton vice captain for his last 12 games. 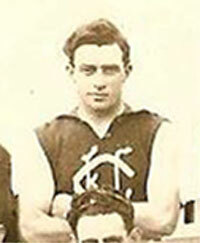 Former Carlton player Harry Toole was one of the Field Umpire applicants. Contributors to this page: blueycarlton , Bombasheldon , molsey , PatsFitztrick , tmd1 , Jarusa , true_blue24 , WillowBlue and admin . Page last modified on Monday 08 of May, 2017 13:15:40 AEST by blueycarlton. 1984 Rd 14 - Celebrations back at Johnston's place. 1987 GF - THE Cup with Bradley and Motley.